A. No. Personal Property Appraisers rely on affiliations with Professional organizations to provide validation. Many of these organizations test and certify their members. Q. How much time does an Appraisal take? A. Certain property is more demanding than others. Jewelry often requires more time as a result of measurement and grading. Typically more valuable items require more research and documentation. 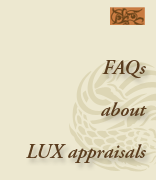 An estimate can be provided after reviewing the subject property. Q. Do I need to leave my property? A. Usually not. Examination and notes can normally be completed at the initial meeting. If further research requires it, we will request that the item(s) be left. This happens more often with paintings, jewelry and other objects that require technical examination. Q. Can Appraisals be done verbally? A. We recommend against it. The major Appraisals Organizations require documents be prepared to validate the conclusions and to protect all parties involved. Any verbal statement without written confirmation is considered a “Verbal Approximation of Value”, and is not generally accepted by Insurance companies or legal entities. Q. How much will my Appraisal cost? A. Cost is based on time spent for examination, research and document preparation.Cost estimates can be provided upon initial discussion or examination. Q. If I have property to sell can you assist me with that? A. If we have provided Appraisal services for the property we cannot purchase it, but we may act as a broker for its sale. If the property has not been appraised by our firm, and you wish to use our Liquidation services, we may purchase the items or consign them for sale. A. We regularly serve the entire Bay Area and California. We are also happy to travel longer distances to provide services.